Anaesthesia is a vital component of basic health care and merits an appropriate share of available resources. Monitoring is essential in anaesthetic practice to safeguard quality and to prevent untoward incidents. Developed nations have their own specific standards of monitoring The Indian Society of Anaesthesiologists (ISA), taking guidelines from the WFSA and subsequent to wider deliberations in different forums, promulgate monitoring standards for anaesthesia with immediate effect. These standards are applicable for Anaesthetic service in any part of the Indian Union in any sector. The ISA authorise these standards as National Monitoring Standards. Are essential for improvement of the functional quality of service and are needed to function. Are vital standards which are needed at any place for any pre-planned anaesthetic service. Vary depending on the type of surgical work and the hospital. The World Federation of Societies of Anaesthesiologists (WFSA), recommended ‘Monitoring Standards’ published as ‘International Standards’ which were followed as Indian Monitoring Standards, will cease to be operative with this publication. These standards will undergo further revision as and when practice and technology advance. Only qualified Anaesthesiologists are permitted to administer anaesthesia. Resuscitation equipment conforming to National standards must be available in the workplace in adequate quantity / quality. Appropriate ‘Anaesthesia Forums’ may be established and will form links with the needed Authority for Training, Certification and Accreditation. Institutional, Regional or National Protocols on Anaesthesia practices may be instituted and facilities for updating of knowledge may be ensured to improve quality. A record of details and course of each Anaesthesia procedure should be made and preserved along with the patients medical record. Sufficient number of trained Anaesthesiologists should be available at major Hospitals and the workload should be distributed so as to avoid over or under utilisation. The Anaesthetist should take the responsibility for the transport of the patient to post-anaesthesia recovery area as well as for later consultation if needed until the patient makes adequate recovery from Anaesthesia. 1. Pre-anaesthetic evaluation and adherence to a protocol is mandatory. Service should be administered by qualified Anaesthesiologist possessing registration in modern medicine. 2. Availability of resuscitation equipment, uninterrupted supply of oxygen and minimum Anaestheisia equipment should be confirmed before starting the procedure. 3. 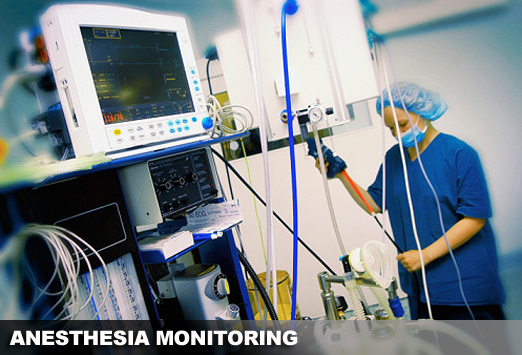 Clinical Monitoring of colour and pulse should be done every 5 minutes during conduct of Anaesthesia. 4. A light source should be available always. 5. Stethoscope, BP apparatus and Thermometer should be available. Basal recording should be made before the start of procedure. 6. Cardioscope with Defibrillator capable of displaying the rate and wave pattern should be available. 1. All basic standards detailed above should be met with. 2. Anaesthetic machine and equipment used should have failure warning facility as well as check list for failure correction. Every operating Theatre should have at least one operable Anaesthestitic machine. 3. Periodically calibrated vaporiser (Drug Specific) should be available. 4. Every procedure should be monitored with pulse Oxymeter to observe oxygen saturation. 5. Major procedure undertaken should be monitored with as many varying equipments such as Airway Pressure Alarm, Oxygen, Concentration Analyser, Neuro-Muscular Monitor, Respiratory Volume Monitor, Non-invasive BP Monitor, Capnometer, etc.